Rajya Sabha members can speak in any of the 22 scheduled languages from the monsoon session of Parliament beginning on July 18. The India-Korea Technology Exchange Centre was inaugurated by the Minister of State (I/C) MSME Giriraj Singh in New Delhi. The Tamil Nadu Assembly adopted legislation for constituting the anti-corruption panel Lokayukta in the State. Aujas Networks, a cybersecurity firm has opened a ‘Security Operations Centre’ at Bengaluru. The Odisha government ordered a ban on the use of plastic bags from Gandhi Jayanti in October. The Odisha government and Tata Trust will jointly spend Rs.1,000 crore for development of cancer care facilities in the State. Tesla Inc. landed a deal with Chinese authorities to build a new auto plant in Shanghai, its first factory outside the United States. Scientists have discovered the oldest colours in the geological record1 billion-year-old bright pink pigments extracted from rocks deep beneath the Sahara desert in Africa. Google’s ‘Launchpad Accelerator India,’ a mentorship program that would aim to support Indian start-ups that deploy artificial intelligence and machine learning to build solutions for local needs. The top rankers 1) Andhra Pradesh 2) Telangana and Haryana 4)Jharkhand and 5) Gujarat. A five-day international-level workshop on Tsunami Warning Centre Operations at the Indian National Centre for Ocean Information Services (INCOIS), in Hyderabad on July 10. The Union Home Minister Shri Rajnath Singh chairs the concluding session of the 67th Plenary session of the NEC in Shillong. Rajasthan has emerged as the first State to sign a MoU with Microsoft to provide digital training to 9,500 students of government colleges & it will also train 500 faculty members. Venkaiah Naidu becomes first Chairman of Rajya Sabha to sign an MoU with Senate of Rwanda to promote dialogue, capacity building and cooperation. India and South Korea signed a joint statement agreeing to discuss an ‘early harvest’ package for the Comprehensive Economic Partnership Agreement (CEPA). 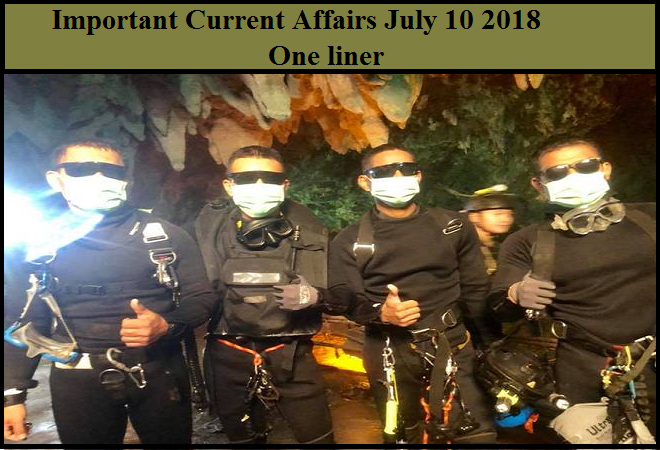 Thai SEAL and elite foreign divers extracted the trapped boys & Coach from the Thailand Tham Luang cave. Ciby Kallingal of Pananchery and T.V. Rajanarayanan of Thiruvilwamala, farmers from Thrissur district – Jagjivan Ram Innovative Farmer Awards, 2017 instituted by the ICAR (Indian Council of Agricultural Research).